Comments: The Caspian Tern is the world’s largest tern and the crested tern most likely seen in the Great Plains. This species has a large, stout, black-tipped red bill and black legs. In flight, their tail appears only slightly forked, the undersides of their primaries are dark and their wings are relatively short and wide giving them a gull-like appearance. Winter birds have a heavily streaked cap and forehead and breeding adults have a black cap. Caspian Terns feed primarily on fish, crayfish and insects and occasionally on carrion, bird eggs and chicks. They nest on bare, sandy or rocky islands in the Canadian Prairie Provinces, North Dakota and eastern Montana. Human disturbance in breeding colonies can lead to substantial chick mortality. 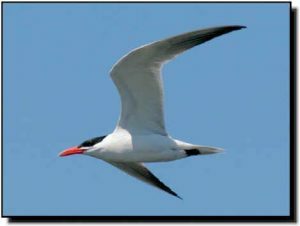 Larger size, bill color, and shape and color of the wings and tail can distinguish Caspian Terns from similar species.